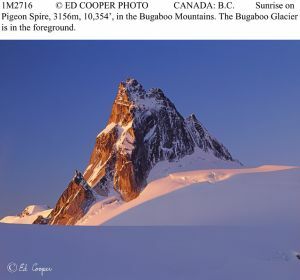 Pigeon Spire is squeezed between the highpoints of the Vowell Glacier to the northwest and the Bugaboo Glacier to the southeast. From certain angles, the peak looks like a pigeon ready to take off. Because of its high perch on the glaciers, the summit routes are generally shorter than other nearby spires. Numerous routes have been put up with the easiest being Class 5.4.